We all know that Instagram became one of the most popular photo sharing apps in the world! 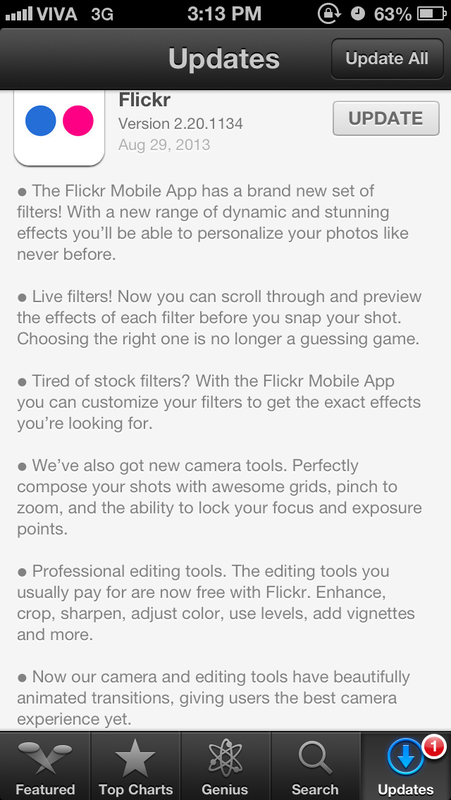 People seem to forget about the other apps that were designed in the first place for photo sharing, like Flickr! In a smart attempt of bringing back people to Flickr, Yahoo decided to attract photographers and bring them back by upgrading their storage space to 1 TB [Read about it here], and by releasing their updated version of Flickr App v 2.20.1134 yesterday afternoon. "Today, we're proud to announce a completely new photo taking experience in our Flickr App that takes full advantage of the depth of capabilities that Apple's iPhone camera has to offer and more. In our view, taking a photo should be an enhancement of what you're experiencing and seeing through your device. We've come up with a camera that gives you full control over how your final photo looks, even before you snap the shot." First change was implemented on the app icon, yes they have flattened their icon to cope with the new iOS 7 main theme. Check the before and after icon look. 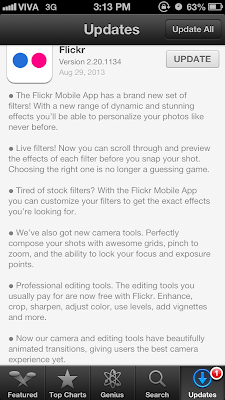 The new flickr update has gained a range of dynamic new filters for some amazing effects on your photos. Now you can scroll through the effects and see live previews, both before and after you take your photo. Not to mention that you can now customise each filter to get the exact effects you are looking for. On the other hand, there are new pro-grade editing tools that let you enhance, crop and sharpen your photos, as well as adjusting the colour, use levels, add vignettes and more. Now this is really such a great feature, I used to suffer when uploading my photos via the app, because Flickr used to upload the full photo even if it was cropped. The new Flickr app also comes with new camera tools, including grids, pinch to zoom, and the option to lock focus and exposure points. It's almost like having a complete photo stuido in your hands. Yahoo rocks!